The FAQs below will assist you to understand and use the functions of the UWA Profiles and Research Repository. If you are setting up or updating your UWA Profile, you may wish to work through our self-guided program, Polish Your Profile. This will assist you in enhancing your profile with up-to-date information about your research, teaching, professional activities and outputs. Quarterly reminders will be sent to you requesting that you check your Profile and add any missing publications. The UWA Publications Manual outlines the eligibility and requirements for each audited category for inclusion into the annual Socratic Index. Note: Changes you make in the UWA Profiles and Research Repository will display on your public profile without significant delays. However, depending on the data that is changed, the time frame for these to update may vary. If these changes do not display within the next day, please contact repository-lib@uwa.edu.au. How long do I have to enter my publications into the UWA Profiles and Research Repository and how can I check if they are already in there? Publications can be entered into the UWA Profiles and Research Repository at any time throughout the year. Staff should check their profiles regularly to ensure their publications are up to date. 2012-2017 publications that meet the audited requirements for the Socratic Index should be entered into the UWA Profiles and Research Repository no later than April 10 2018. Eligible publications entered after this date may not be audited, and there will be no guarantee that it will be included in the 2018 run of the Socratic Index. To check if your publications are in the UWA Profiles and Research Repository, follow the instructions in the PDF below. How will my publications display on my profile in the UWA Profiles and Research Repository, and how will they get into Socrates? Publication records will automatically display on your profile in the UWA Profiles and Research Repository once the record has been processed (i.e. marked as ‘Approved’ or ‘Validated'). Please allow up to two weeks from the day your publication is entered for it to display on your profile. Socrates performs a nightly synchronisation of publications data from the UWA Profiles and Research Repository. Your publications will display in Socrates a day after the publication record has been processed in the UWA Profiles and Research Repository. Which publication categories are eligible for the Socratic Index, and how many points will I receive for each category? Information regarding the Socratic Index can be found on the Socrates help page. What verification materials are required for each auditable category? Verification materials are required to assist with the audit of Socratic Index and ERA eligible publications. Failure to provide verification materials may result in your publication being ineligible for Socratic Index points. A list of verification materials for each audited category can be found in the PDFs below. I have inadvertently excluded the University byline on the publication. How can I ensure it is correctly affiliated now, and how can I use the byline correctly in all my publications? The University's Code of Conduct for the Responsible Practice of Research requires that all staff and students employed by, or enrolled at the University (including Honorary and Adjunct staff) to include the 'University of Western Australia' in their publication byline. Information regarding the University byline and how to affiliate correctly can be found in the PDF below. If you undertook the research in your capacity as a UWA staff or student, and have failed to byline the University correctly on the publication, you can confirm your affiliation to UWA by following the instructions in the PDF below. Information on my Socrates profile is incorrect or missing. Who can I contact? If you notice missing publications from your Socrates profile, you can add them by logging into the UWA Profiles and Research Repository. Please ensure you include verification materials to assist with the audit process. Your Faculty Librarians can assist you should you require help using the UWA Profiles and Research Repository. If you notice any discrepancies to the metadata on your publication records, such as spelling errors, incorrect authors or years etc., you can edit the record directly by logging into the UWA Profiles and Research Repository. The Research Publications and Data Services team will review and approve your changes. These changes will reflect in Socrates overnight. If you have any queries regarding the Socratic Index, please contact the Business Intelligence and Analytics team. If you notice missing HDR student details in your Socrates profile, please contact the Graduate Research School. If you notice missing UWA administered grant details, please contact the Research Grants and Contracts Office. If you have any questions regarding Socrates in general, please contact the Business Intelligence and Analytics Team. I have received an email notification that a publication record has been added to the UWA Profiles and Research Repository. What do I do next? Important: Please do not reply to this email, as it is not monitored. To proceed with the next steps after receiving the email notification, follow the steps in the PDF below. These instructions will also describe how you can disclaim the publication record if it does not belong to you. How do I add my publications into the UWA Profiles and Research Repository? Importing publication details from an online source. If your publication is not indexed by Scopus or Web of Science, or you have not included the 'University of Western Australia' in your byline, you can still import the publication details from these or a number of other online sources. To do this, follow the instructions in the PDF below. You can set up an automated search for your publications in various online sources (i.e. Scopus, Web of Science, PubMed, arXiv etc.). Once you have set up the automated search, the UWA Profiles and Research Repository will find publications from the online source for you to import. Follow the instructions in the PDF below on how to set up an automated search of your publications. If you have a list of your publication details stored in a reference software such as an EndNote Library, you can export them into a RIS or BibTex file to upload directly into the UWA Profiles and Research Repository. Follow the instructions in the PDF below on how to import publication details from a file. If you are unable to import your publications from an online source or file, you can enter them manually to the UWA Profiles and Research Repository using a blank template by following the instructions in the PDF below. Your Faculty Librarians can be contacted if you require further assistance on how to add your publications. How do I add a Creative Work to the UWA Profiles and Research Repository? To add a creative work to the UWA Profiles and Research Repository, use a blank template to manually create a record. You can do this by following our instructions on how to add a publication using a blank template. Please consult the Faculty of Arts, Business, Law & Education (FABLE) Checklist for adding creative works into the UWA Profiles and Research Repository. Ensure you include all verification materials required for audit. For assistance with adding creative works, contact the FABLE Librarians. I found one of my publications in the UWA Profiles and Research Repository, but it is not displaying on my profile under Research Outputs. How do I claim it? If you find publications in the UWA Profiles and Research Repository that are not on your profile, you can 'claim' them by following the instructions in the PDF below. Can I enter a publication on behalf of a colleague? You can only enter a publication on behalf of a colleague if you are a co-author on the publication. The UWA Profiles and Research Repository will not allow you to Save a record unless you have been added as an Author to the publication record. I am a new staff member. Do I need to add non-UWA affiliated publications to the UWA Profiles and Research Repository? Yes. Your non-UWA affiliated publications should still be added to the UWA Profiles and Research Repository, as they may be eligible for the Excellence in Research for Australia (ERA) submission and for internal reporting (including the Socratic Index). They will also appear on your profile in the UWA Profiles and Research Repository. Please contact your Faculty Librarians if you require assistance. Is there support specific to my faculty? For advice specific to your faculty, consult the faculty checklists below or contact your Faculty Librarian. You can also consult the UWA Publications Manual, which outlines the requirements for the collection of research publications. I recently submitted my thesis to the Graduate Research School. How long will it take for my thesis to appear in the UWA Profiles and Research Repository? Once you have submitted your thesis to the Graduate Research School, you should allow 3-6 weeks for your thesis to become available in the UWA Profiles and Research Repository. I have completed my PhD/Masters degree at UWA, but my thesis is not listed in the UWA Profiles and Research Repository. Can it be added? If you have a digital copy of your thesis it can be submitted to the UWA Profiles and Research Repository along with the completed and signed Authority to include a thesis to UWA Research Repository form. If you do not have a digital copy of your thesis, please contact repository-lib@uwa.edu.au to discuss options for making your thesis available. I have completed my Masters by thesis and coursework course at UWA. However, my thesis is not listed in the UWA Profiles and Research Repository. Can it be included? To comply with the University Policy, the UWA Profiles and Research Repository archives only theses/dissertations for courses that have a research component of 66% or higher. If your course does not satisfy this requirement, your thesis will not be included in the UWA Profiles and Research Repository. I completed my PhD/Masters degree at a different institution. Can I upload my thesis in the UWA Profiles and Research Repository? The UWA Profiles and Research Repository does not collect non-UWA theses, however if you wish to include your thesis in the UWA Profiles and Research Repository, you can manually add it using the ‘Non-UWA Thesis’ template in the Research Output content type. The current embargo on my thesis file is due to be released. How can it be extended? To extend the restricted access to your thesis in the UWA Profiles and Research Repository you will need to submit an Application for Restricted Access to the Graduate Research School. Once it is approved, we will extend the embargo on your thesis for the approved period of time. How do I add a full text copy of my publication to the UWA Profiles and Research Repository? UWA authors are responsible for depositing copies of their Author Accepted Manuscripts (AAM) in accordance with the UWA Code of Conduct for the Responsible Practice of Research. This not only allows your research to be made freely available to anyone with an internet connection, but also takes your research to a wider audience, making it easier for other researchers to find and cite your work. Making your publication open access also enables you to comply with funder requirements, particularly if your publication arose from an ARC or NHMRC supported research. Alternatively, you can add a copy of an AAM to a publication record by following the instructions in the PDF below. What version of a publication should be added to the UWA Profiles and Research Repository if I want to make it openly accessible? The full-text version of a publication that can be made available in the UWA Profiles and Research Repository depends on the publisher's policies. 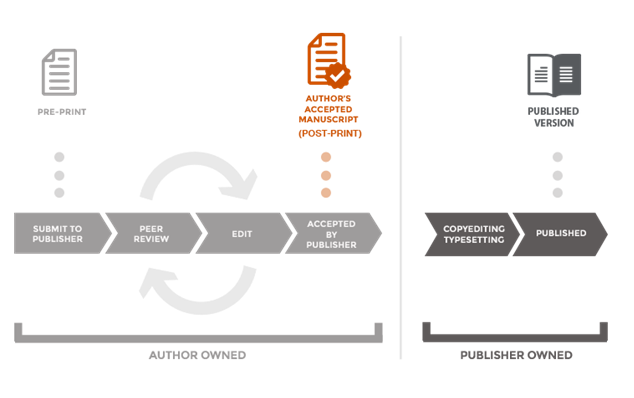 In most cases, the publisher permits the Author's Accepted Manuscript (AAM) version to be made Open Access. This is the version authors need to provide to the UWA Profiles and Research Repository. 'Which version to upload' image courtesy of Digital Services, University of Cambridge used under CC BY-SA 4.0. In a few situations, the publisher permits the final, published version to be made available. 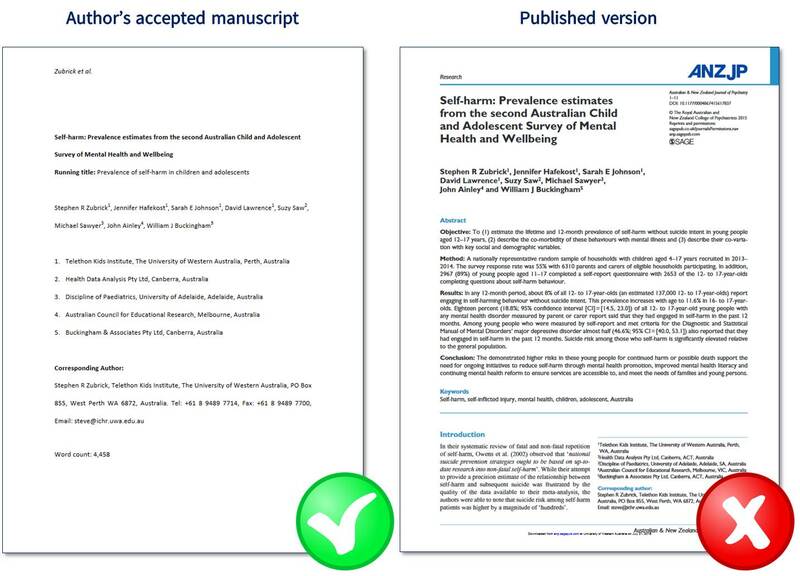 The pre-print (draft prior to peer-review) is not accepted by the UWA Profiles and Research Repository. Pre-prints do not meet the requirements of the ARC and NHMRC Open Access policies. The SHERPA/RoMEO database contains journal and publisher policies on making publications available in a repository. What is the Author's Accepted Manuscript (AAM) version? How do I add ARC and NHMRC grant details to my publication record? What are the requirements for depositing ARC and NHMRC-funded research into the UWA Profiles and Research Repository? To comply with the ARC and NHMRC Open Access policy, UWA researchers are required to deposit their research publications into the UWA Profiles and Research Repository. Please see the ARC and NHMRC Open Access policy page in the Open Access Toolkit for further details. How do Library staff know that a publication has been funded by the ARC or NHMRC? What and where is my UWA profile? Profiles in the UWA Profiles and Research Repository are the sole, authorised public profiles for UWA staff. They enable access to comprehensive and up to date information about research, teaching activities, professional expertise and outputs. A profile has been established for all UWA research and teaching staff. Any UWA academic or professional staff member who does not have a profile in the UWA Profiles and Research Repository can request one by emailing help-repository@uwa.edu.au. Current Higher Degree by Research (HDR) students can request a profile in the UWA Profiles and Research Repository. They will be required to activate and link an ORCID iD to the Repository before their profile will be made visible. Profiles will be disabled once a student completes their course or leaves the University. HDR students can request a profile by emailing help-repository@uwa.edu.au. How do I add a good photo to my profile? The UWA Profiles and Research Repository accepts files in JPG, PNG and GIF formats, with a maximum of 1024kb. You may like to consider engaging a photographer to take one of you. If you had a profile photo in the UWA Staff Profile in the Contact Directory, this will have been transferred to the UWA Profiles and Research Repository. You can edit this if you wish. To add a photo to your profile, follow the instructions in the PDF below. Which profile fields are synchronised from other systems and how can I change them? A number of fields within your profile in the UWA Profiles and Research Repository are automatically entered from the UWA HR system, Alesco and from the UWA Contact Directory. Higher Degree by Research (HDR) students need to contact the Student Administration (this can be done in person at the Student Central Building), or submit an askUWA request if they need to make changes to their title or to their name (supporting documents should be provided). After the PhD completion the titles will be automatically updated to 'DR' in the Student Management System. How do I update my Personal Profile section, including my biography, professional background and education and qualifications? Your Overview tab within your public profile allows you to present a range of information about yourself under a broad Personal profile heading. The left side of the profile contains free-text content arranged under a series of headings that you can select from to describe your research, teaching and professional background. The right side of the profile displays your education and qualifications, positions outside of the University and your areas of expertise. To update your biography, research, teaching and professional background, follow the instructions in the PDF below. To update your education, qualifications and positions outside the University, follow the instructions in the PDF below. Job titles are great but remember not everyone is going to know what they mean. Where you give a position title, it's useful to qualify it with a brief explanation of the role. Avoid writing lists of accomplishments or previous jobs - that is more the realm of a resume. Remember to try and keep things conversational. Avoid acronyms, unless they are very well known such as ABC, HBF, CNN etc. Keep an eye on length. Less can often be more! Foremost, consider your audience - who is reading this and what do they need to know? How do I add teaching units to my profile? You can add current UWA Teaching units to your profile. They will display under the Units tab on your public-facing profile. It is recommended that you update your profile each Semester to remove units that are no longer running. Students are not able to add teaching units to their profiles. To add UWA Teaching units to your profile, follow the instructions in the PDF below. How do I link to my personal homepage, social media and other profiles? The UWA Profiles and Research Repository allows you to add a number of social media or personal links to your profile. To add these links, follow the instructions in the PDF below. What is a Fingerprint and how is it generated? The UWA Profiles and Research Repository uses a Fingerprint tool to create a weighted index of terms to describe your areas of expertise. It is based on information contained in your profile, including the titles and abstracts of your publications. These terms form a Fingerprint which highlights your subject interests. If you have any publications in the UWA Profiles and Repository, by default these terms will be visible on your public profile under the Fingerprint tab. The Fingerprint can be amended or removed entirely. To add terms to your Fingerprint, follow the instructions in the PDF below. To remove terms from your Fingerprint, or to turn off the entire Fingerprint feature, follow the instructions in the PDF below. How do I add keywords to my profiles? By adding Industry and Research Expertise keywords to your profile, you can ensure that your research interests are meaningfully described and discoverable. These keywords will appear under the keywords section of your public profile and will be searchable using the free-text search option on the UWA Profiles and Research Repository homepage. To assist with the identification of academic staff for specific industry audiences, the University’s Business Development and Innovation (BDI) team has developed a list of Industry keywords for use on profiles. You can select appropriate industry keywords from the list provided or seek guidance from the BDI team members in your Faculty. To add industry keywords to your profile, follow the instructions in the PDF below. Choose your own keywords to describe your expertise. To add Research Expertise keywords to your profile, follow the instructions in the PDF below. Using a Fingerprint tool, the UWA Profiles and Research Repository automatically generates keywords for any staff member who has publications or prizes in the Repository, or who describes their research in the Research field of their profile. Follow the FAQ on fingerprinting to check that the terms on the Fingerprint tab of your profile accurately reflect your research interests. You may omit terms or turn the Fingerprint off if it does not work for you. How do I add activities, prizes and press/media information to my profile? Prizes, Activities and Press/Media are all content types you can add to your public profile. Each content type will appear as a separate tab in your profile. You can create links from these records to other related information in your profile, such as an award or related research output. Students are not able to add prizes, activities or press/media to their profiles. To add prizes, activities or press/media to your profile, follow the instructions in the PDF below. How do I add a title or academic degree to my profile? Staff titles are synchronised from the UWA HR system, Alesco. Higher Degree by Research (HDR) students' titles are synchronised from studentConnect. You can also add additional titles and academic degrees (including post-nominals). These will display under your name on your public profile. To add additional titles and academic degrees, follow the instructions in the PDF below. How do I switch off the display of metrics on my profile? The UWA Profiles and Research Repository displays metrics for any of your publications listed in the Scopus database that are included in your profile. H-index – Based on the citations received for your UWA Research publications in Scopus. This may be different from your h-index within Scopus which may include additional publications. Publication and Grants bar graph – a count of how many research outputs and grants are included in your profile in the UWA Profiles and Research Repository by year. Note: It is not possible to switch off the display of this graph from your public profile. If the Citations and H-index aren’t appropriate for your profile, they can be switched off by following the instructions in the PDF below. Why are the citations and h-index on my profile different to those in Scopus, Web of Science, and Google Scholar? UWA Profiles and Research Repository calculates your h-index by retrieving citation counts from Scopus for the publications added to your profile. If you notice a difference in the h-index between systems this is because although there is a large overlap in their coverage, Scopus, Web of Science and Google Scholar have some variation in the journals they index. If there is a discrepancy between your h-index on your Profile and your h-index on Scopus, it is likely that not all your publications have been added to the UWA Profiles and Research Repository. Follow our instructions to add any missing publications. The UWA Profiles and Research Repository will then re-calculate your h-index. This will be updated on your profile after every weekend. If you do not wish for citation counts and the h-index to be displayed on your profile, they can be switched off by following our FAQ instructions. For additional information about the h-index please visit the Library’s Citations, Altmetrics and Researcher Profiles guide. How do I add Grants information to my profile? Grants that are administered by UWA, and therefore recorded in InfoEd are pulled across automatically into the UWA Profiles and Research Repository, and will display on staff profiles. This information cannot be edited and is updated from InfoEd nightly. Grants which are not synchronised from InfoEd, including student grants and grants which are not UWA administered, can be described in the Funding overview section found in the Overview tab of your public profile. Visit our FAQ for instructions on how to edit this area of your profile. The information in my Grants tab is incorrect. How do I fix it? Data displayed in the Grants tab of your profile come from InfoEd, and will need to be amended by contacting the Research Grants and Contracts Office: reporting-research@uwa.edu.au. If the data displayed in the Funding Overview section of your profile is incorrect, you can login to your profile and update the information. ORCID® provides researchers with a globally unique iD that can be used throughout their scholarly career. In an international research environment, your ORCID distinguishes your research output from all other researchers to ensure consistent, reliable attribution of your work and accurate measurement of your research impact. ORCID stands for Open Researcher and Contributor ID. Profile page which can include your list of publications. Note: ORCID does not track citations and your ORCID profile will not include citation counts. Why should I have an ORCID® iD? Eliminate name ambiguities, ensuring all your research outputs are linked to your name and name variations. Allow the UWA Profiles and Research Repository to find and match your research outputs more efficiently, saving you time. The UWA Code of Conduct for the Responsible Practice of Research requires authors to include their ORCID® in publications and to ensure that their ORCID iD is linked to their profile in the UWA Profiles and Research Repository. How do I get an ORCID® iD? First, check whether you already have an ORCID® iD before you register for one to avoid creating a duplicate profile. Try searching for your name on the ORCID Website. If your name appears, try logging in using your current or previous email addresses. You may need to use the Forgotten password option. To create a new ORCID® iD, you can register for one through your profiles in the UWA Profiles and Research Repository. The two profiles will automatically be linked. Registration for an ORCID® iD is free. Follow the instructions in the PDF below on how you can create an ORCID® iD. Why should I link my ORCID® iD to the UWA Profiles and Research Repository? Automatically update your ORCID® record when new outputs are added to the Repository. Add an official UWA affiliation to your ORCID® record. Enable Higher Degree by Research (HDR) students to have a visible profile in the Repository (registering your ORCID® iD is a mandatory requirement for HDR student profiles). If you already have an ORCID® iD, follow the instructions in the PDF below on how you can connect your ORCID® iD to your profile in the UWA Profiles and Research Repository. Alternatively, you can watch the short video below. Note: Publications that are listed in your ORCID® profile won’t be transferred to your profile in the UWA Profiles and Repository. How can I use my ORCID® iD most effectively? Associate your ORCID® iD with all your name variations to ensure all of your research work is attributed to you. Link your ORCID® iD to your profile in the UWA Profiles and Research Repository. This is a UWA requirement. Quote your ORCID® iD when submitting a manuscript. This is a UWA requirement. Include your ORCID® iD in funding submissions and grant applications. ARC and NHMRC encourage all researchers applying for funding to cite their ORCID®. Put your ORCID® iD on your webpage, CV, email signature, conference presentations and in social media. You can also link multiple institutional or other accounts to your ORCID® account. Once linked, any of these may be used to access your ORCID® record. To link multiple accounts, repeat the linking procedure for each additional account. You can view the accounts that you have linked to your ORCID® record in your ORCID® account settings. I uploaded my research datasets to Research Data Online (RDO). Are they now in the UWA Profiles and Research Repository? The University Library has migrated all research datasets which were held in Research Data Online (RDO) to the UWA Profiles and Research Repository. The Migration Project was completed in August 2017. If you have previously uploaded your datasets to RDO, you will now be able to view them in your researcher profile when you login to the UWA Profiles and Research Repository. RDO is now decommissioned. The project ensured that the current URLs, handles and DOIs for your datasets were maintained and redirected to resolve to the new UWA Profiles and Research Repository. You will not need to notify your publishers of the changes. UWA staff and Higher Degree by Research (HDR) students can login and upload their research datasets to the UWA Profiles and Research Repository directly. You must agree to the Terms of Agreement which will appear as a pop-up when you attempt to create a new dataset in the UWA Profiles and Research Repository. A submission guide is available here. Research Data means facts, observations or experiences on which an argument, theory or test is based and could be retested. Data may be numerical, descriptive or visual. Data may be raw or analysed, experimental or observational. Data may include but are not limited to: laboratory notebooks; field notebooks; primary research data (including research data in hardcopy or in computer readable form); questionnaires; audiotapes; videotapes; models; photographs; films; test responses. Provenance information about the data might also be included: the how, when, where it was collected and with what (for example, instrument). The software code used to generate, annotate or analyse the data may also be included. Why should I upload my research datasets to the UWA Profiles and Research Repository? The UWA Profiles and Research Repository can publish your research datasets making them publicly discoverable and reusable. Expansion to the scale and impact of research: Research data can be cited by other researchers which can amplify your research impact. Increased collaboration and reduced duplication: Your research datasets become more discoverable thus making other researchers aware of your research. Research integrity: The validity of research results can be substantiated. Future applications: Research data preservation allows for the application of developing analytical technologies within a field of research. The repository is a data sharing platform. It is not a storage solution for your data. For further information on data storage options, please visit the Research Data Management Toolkit and the Institutional Research Data Store (IRDS). How can I upload datasets to the UWA Profiles and Research Repository? UWA staff and Higher Degree Research (HDR) students can login and upload their research datasets to the UWA Profiles and Research Repository directly. Set Status (at the bottom of the form) to Entry in progress. Set Status (at the bottom of the form) to For Validation. The library will mint a DOI, validate and publish your dataset in the UWA Profiles and Research Repository Portal. Your metadata will also be harvested into Research Data Australia. You will not be able to edit or delete your dataset once published unless there are minor spelling errors in the metadata description. A copy of the Terms of Agreement are here. Can I obtain a DOI for my dataset? As part of the workflow process a DOI will be minted for your dataset once you have submitted the dataset record for approval. Once you have a DOI assigned to your dataset record and the record is made public, you can no longer delete or edit the record. You can however create a new dataset record and describe it as a different version to the previous dataset. You can also link the two records within the dataset submission form. What kind of data formats can be deposited in the UWA Profiles and Research Repository? You can deposit any data in the UWA Profiles and Research Repository as long as you have permissions and the data does not have any ethical or legal constraints. For more information or if you have any queries, please email Research Publication and Data Services. What file sizes can be deposited in the UWA Profiles and Research Repository? The UWA Profiles and Research Repository will accept individual files up to 2GB. For larger files contact Research Publication and Data Services. Can I edit my dataset submission? You will not be able to edit or delete your dataset once published unless there are minor spelling errors in the metadata description. To make minor edits, please contact Research Publication and Data Services (RPDS). New versions of your dataset can be uploaded as a separate dataset records which can then be linked to previous versions within the repository. Can I delete my dataset submission? To delete a draft record, click on the red X at the bottom of the submission form. You will not be able to delete your dataset once published. Items may be removed from UWA Profiles and Research Repository. Are all dataset metadata published in Research Data Australia? All research data metadata is harvested into Research Data Australia on a weekly basis. Can I change the order of how multiple files are displayed? You can change the order of the appearance of the dataset files within the submission form. Once all the files are uploaded, they can be moved up or down within the file list by clicking on the up/down arrows next to the file name in the submission form. How do I publish my dataset? The library will mint a DOI, validate and publish your dataset in the UWA Profiles and Research Repository Portal. Your metadata will also be harvested into Research Data Australia. For further assistance see the Submission Guide for Researchers for help with adding research datasets to the UWA Profiles and Research Repository. What licenses can I select for my published files? You can instantly assign a license to a dataset file during the upload process. Creative Commons licenses can provide further assistance on selecting an appropriate license. What are the Terms of Agreement for uploading datasets to the UWA Profiles and Research Repository? If you have used equipment from the Centre for Microscopy, Characterisation and Analysis (CMCA) in your research, you can now link your publications, research datasets, grants and CMCA equipment in the UWA Profiles and Research Repository. This will help enhance your Researcher Profile to potential collaborators. Follow these instructions to relate your publications/datasets with CMCA equipment. Any requests to add new equipment records should be forwarded to help-repository@uwa.edu.au.